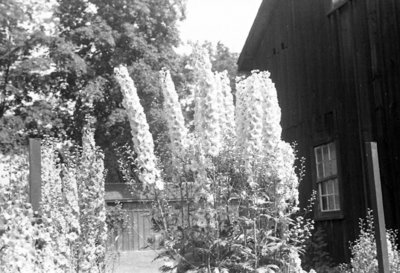 Black and white negative showing Arthur Wellesley Lynde's delphinium garden. Arthur Wellesley Lynde, son of John Jabez Lynde and Elizabeth Wilson, was born at Whitby on 5 May 1887. He was a musician and was appointed to be in charge of the music program in Whitby public schools in 1925. He was supervisor of music for many years and was a choir leader in Whitby's United and Presbyterian Churches. One of Arthur's main hobbies was growing delphiniums and he was a recognized authority on these flowers, winning many prizes at the Canadian National Exhibition. He died at Oshawa on 5 April 1952 and is buried at Oshawa Union Cemetery. Arthur Wellesley Lynde's Delphiniums, July 8, 1937, Marjorie Ruddy. Whitby Archives A2013_040_034A.